Only the best quality materials are used! Nanci Ransom grew up on the Canadian side of the Akwesasne Mohawk Reservation in the village of St. Regis, Quebec. I am a Mohawk basket maker from Akwesasne, bear clan. I make utility and fancy baskets from black ash splint and sweetgrass. Sheila Kanieson Ransom, Wolf Clan of the Akwesasne Mohawk Nation has been making black ash and sweet grass baskets for more than 20 years. The Mohawk Made website was created by three Mohawk Women who enjoy the art and preserve the skills of the Native American tradition of basket weaving. Many years have passed with parents and grandparents carrying on this unique tradition of basket weaving. As these generations have past, the sweet grass and ash splint baskets, for the use of utilitarian, ceremonial and decorative, continue to be an important part of Mohawk culture. 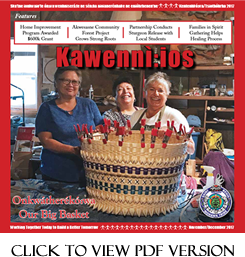 The ladies of Mohawk Made have over sixty combined year of experience in basket making and continue to grow their tightly weaved friendship together. Each one of them have a story to tell on how they began their journey for the love of basket making and weaving their creations. They are Sheila Ransom, Debbie Cook-Jacobs and Nanci Ransom. They continue weaving through generations of culture and friendship.